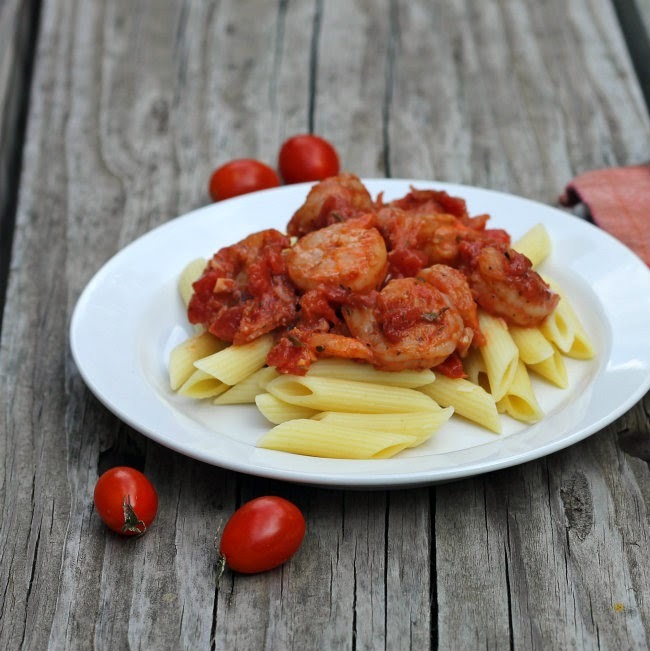 This shrimp dish is perfect for dinner during the work week or the weekend. There is definitely a chill in the air. I think that we can say for sure that fall is here. The weatherman is even talking about frost, just north of us in the next few days. I love fall, but I am not sure if I am ready for the cold weather yet. Really summer just started, or at least it feels like it. With the cooler weather, I am really getting ready for some hearty comfort foods. 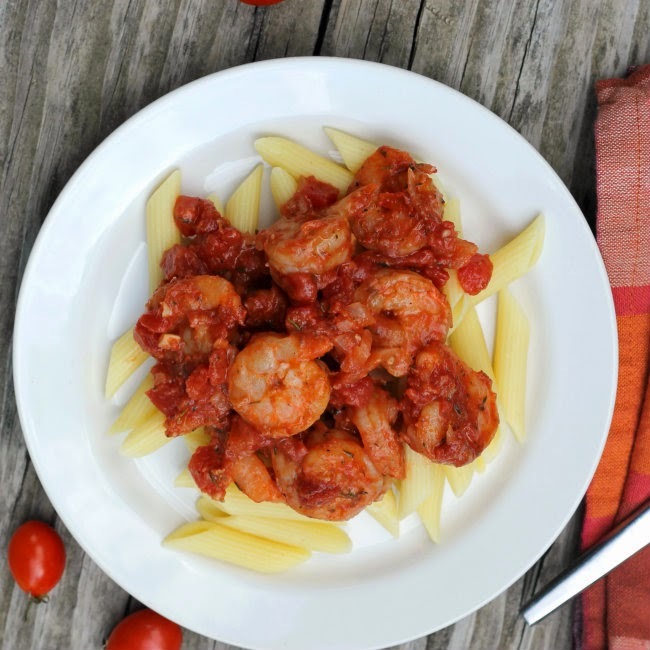 So why not start it out with this shrimp and pasta served with a tasty tomato sauce? Pasta with tomato sauce is one of those comfort foods that I enjoy when the weather gets a bit cooler out. I love this shrimp with this dish; you coat them with a mixture of garlic salt, pepper, onion powder, and paprika before you cook them in a bit of olive oil. I really loved the flavor of these shrimp. They are then removed from the skillet and that is when you make your sauce. The sauce is easy to make and has a great flavor; I actually made this recipe three times before I got the sauce to what I think is just about perfect, at least to what I think is perfect. When the sauce is made the shrimp are added back. Once they are heated back up serve it over pasta. Some crusty bread would be a great to complete this meal. Believe me when I say that I had a hard time to stop eating this, it is one of those dishes that you just want more and more of. 1. Place shrimp in a large plastic bag. Mix the first 4 ingredients together and add to the bag with the shrimp. Shake the bag until all the shrimp are coated with these ingredients. 2. In a large non-stick skillet add the 2 tablespoons of olive oil. Heat the oil over medium heat for 1 or 2 minutes until it is heated. 3. Add the shrimp in a single layer and cook until the shrimp are pink, it will depend on the size of your shrimp. Turn shrimp over and continue to cook until the shrimp is done. 4. 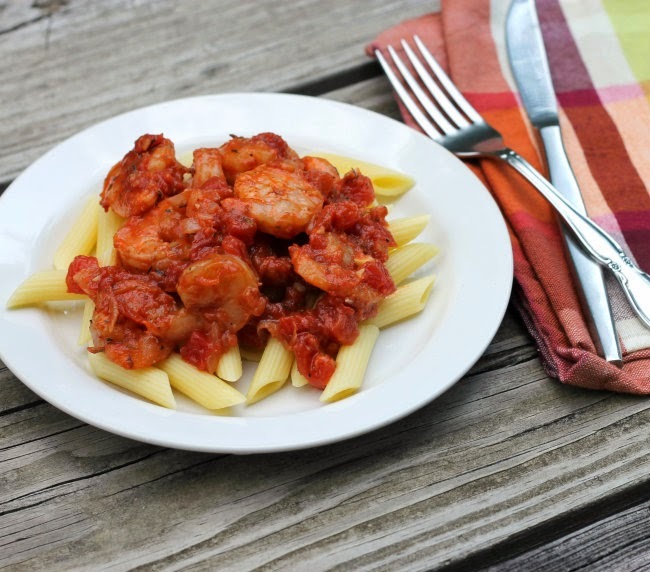 Remove shrimp to a plate with a slotted spoon. 5. If needed add the 1 teaspoon of olive oil. Add the onion and garlic to pan and cook for 2 to 3 minutes until onion is starting to soften. Stirring frequently so the onion and garlic don’t burn. 6. Add the diced tomatoes, tomato paste, Italian seasoning, red wine, and Parmesan cheese, stir until well blended. 7. Cook for 2 to 3 minutes to let the flavor come together. Add the shrimp back and continue to cook for another minute or so to warm the shrimp. 8. Serve with your favorite pasta. Sprinkle with additional Parmesan cheese if desired. Yes, let’s definitely not talk about frost. I’m not ready for it yet!! Comfort food meals like this sound so good though! I agree, the cooler weather makes me crave heartier meals. Once I make a big vat of spaghetti sauce you know the cool weather is here to stay. I think I’ve told you before, I love anything with shrimp in it, so this recipe is perfect for me. Thank you for sharing this Brilliant recipe on #PureBlogLove Link Party! It looks utterly delicious! I love shrimp and tomato, but for me, it’s gotta have some heat too.